On March 7, 2014 a lawsuit against the City of Hackensack was filed by Donald Lenner, Esq. in Superior Court on behalf of Jason Nunnermacker. According to the lawsuit, Nunnermacker made an Open Public Records Act request on January 17, 2014 seeking copies of legal bills submitted to the City of Hackensack by the firm McElroy, Deutsch, Mulvaney, and Carpenter, LLP. On January 21, 2014 the City Clerk, Deborah Karlsson, advised Nunnermacker that there would be a $450 special service charge in fulfilling this request. Regarding this matter, Donald F. Burke, Esq., a lawyer who practices in the area of freedom of speech and governmental transparency said "Bills for legal work provided to a governmental entity are by their nature records over which there should be no expectation of confidentiality." He went on that, "records of billing should be expected to be scrutinized by the public who ultimately pay the bills." Burke had several discussions with the City Attorney on this very matter when the City quoted me $900 for the redaction of legal bills. After having billed the City $150 for these conversations with my attorney, the City Attorney advised residents there would be no fee (going forward) for the redaction of bills (perhaps Mr. Scrivo's firm should pay Mr. Burke for his "consult," as according to Contillo's ruling, his position had better legal basis....). Former City Attorney Richard Salkin, who was inadvertently provided unredacted copies of the bills in question, has contended at public meetings that it is not very difficult to be careful when preparing invoices as to not reveal confidential information, as the City Attorney you have to have an expectation that these bills will be reviewed by the public. The City Attorney later redacted these bills, sent them to Salkin, and requested he return the unredacted copies (Salkin, did not). Despite the City Attorney redacting these legal bills and providing them to both Richard Salkin, and myself, without charge, the City continued to deny Nunnermacker access to the bills without payment of a $450 service charge. According to court documents, the City contends that in the hustle and bustle of running a City, this request slipped through the cracks. Though the City contends Nunnermacker's suit was not the reason he was provided the bills, the Honorable Robert Contillo found that the bills were provided on the same day the City was served with the complaint and he states in his ruling that "had plaintiff not brought suit, the records would not have been produced to him without the pre-payment of the $450 special service charge." Contillo further states that "shifting to the requestor reasonable legal expenses incurred by the City in complying with the request (here, said to be $450) will price out some subset of requestors." Contillo goes on that the City's policy of shifting the fees for redaction of bills to the residents lacks any support under the law and has the "inevitable effect of restricting access to public records." I made many attempts by telephone, e-mail and coming to a meeting to gain public documents, which by State law, must be immediately accessible to Hackensack citizens. I advised the Mayor and Council that the City's position as to my OPRA request was entirely frivolous but such warning fell on deaf ears. Despite campaign rhetoric of making government more open and transparent, this Mayor and Council continually frustrated and blocked my efforts to obtain basic public documents compelling me to file suit with the Court to enforce fundamental rights as a resident of the City. 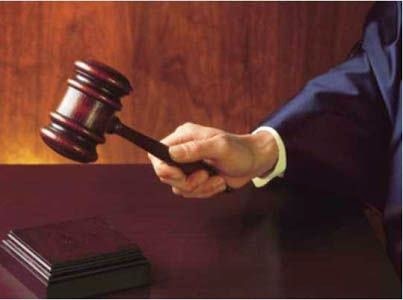 Now, a Presiding Judge of the Superior Court has found that "the City's policy would have the inevitable effect of restricting access to public records" while holding that the Mayor's and Council's position on open, government records to be entirely baseless and contrary to the basic rights of Hackensack citizens. Despite empty campaign promises to reduce attorney's fees and while relying upon questionable legal advice, the City has paid the City Attorney in excess of $5,000.00 in tax payer money to date in an attempt to obstruct access to governmental records. In addition, the Court has ordered that the City must now pay my own legal fees, which will also be several thousands of dollars. Accordingly, over $10,000.00 of tax payer hard earned money has essentially been flushed down the toilet by the Mayor and Council. Donald Lenner, Esq., who represented Jason Nunnermacker in this matter has ten days to submit an invoice for consideration. According to public records, the City Attorney billed $5,412.88 in connection with this matter in the month of March alone. With the matter not having been heard until May, and Lenner's bill yet to be prepared, I can only imagine how much more this farce will cost the tax payers. Hackensack has long had an "us versus them" political line--the Zisa regime versus the persistent Citizens for Change. In the past several months we have seen an interesting shift, a uniting of both sides of the political landscape around controversial issues such as the Council's creation of political patronage jobs and placement of political friends to key positions within the City. Since the May 5th Committee of the Whole meeting, residents, tax payers, and city employees have come by the masses to demand action--mainly the removal of Thom Ammirato and Anthony Rottino from their respective positions, and the reversal of Municipal Prosecutor Frank Catania's controversial health insurance benefits. In all of the impassioned pleas to the Council, there has been a lone dissenting vocal resident (as they say, there is always one). Deborah Keeling-Geddis, who served on the transition team for the Citizens for Change slate, has attended and spoke at a number of public meetings in an attempt to discredit other members of the public and bolster Anthony Rottino with long prepared lists of Rottino's "accomplishments" in his short stint as Interim City Manager. I will refrain from comment on these "lists." For any reasonable person who witnessed or watches her read her "self-prepared list" they will have the same skepticism over her knowledge, sincerity, and whether or not she prepared the list... 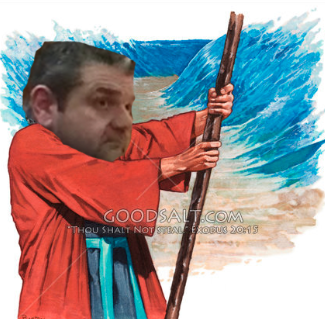 I will say that my favorite item on the list is "solving the flooding problems on Old Hoboken Road......"
Rottino "solving the flooding problems on Old Hoboken Road......"
When there is one active, vocal, dissenter, you have to wonder--do they know something the rest of us don't? Well..... I dug a little deeper..... and I think I found an explanation. Is Deborah Keeling-Geddis serving as the new Hackensack "Head Hunter?" 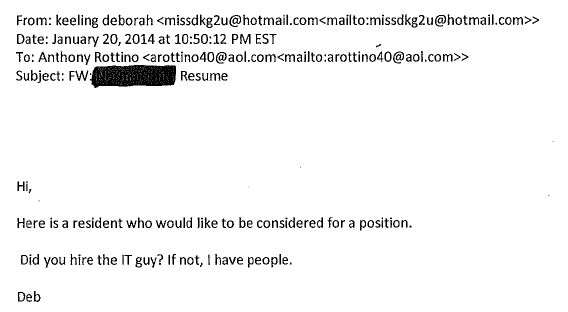 It appears that Keeling-Geddis has a main line to Anthony Rottino's office, and maybe the Human Resources Department. Responses to OPRA requests by the City of Hackensack show that Mr. Rottino may have made Keeling-Geddis feel like quite the important lady. 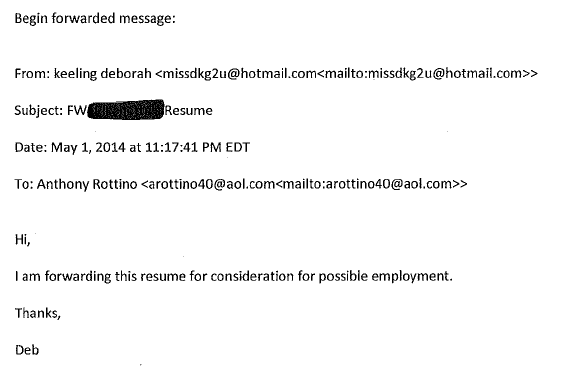 In November, Rottino was the Director of Economic Redevelopment, he wouldn't have had a say in hiring. Keeling-Geddis should have known that--she was on the transition team. She must have been confused when she was trying to get her friend a job and sending their resume to Rottino. Did this person get a job? 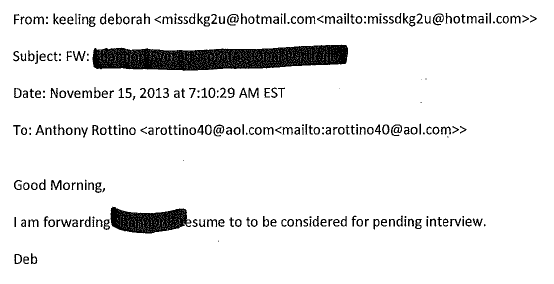 I wonder.... Hackensack thought it appropriate to redact their name and resume. Need an IT guy? Keeling-Geddis "has people." How many? Were more resumes passed to Mr. Rottino? Were these people hired? Who knows... Hackensack has withheld the identity of these applicants. In January, another friend needs a job... Did they get it? I wonder.... Hackensack has withheld the identity of this applicant. These are just the people Keeling-Geddis knows who need JOBS. She has submitted a number of applications for Boards in town. I bet she feels important. I bet she feels even more important if she can take the credit as the "power-broker" who got these people their jobs/appointments. Sorry if I don't see the sincerity in Keeling-Geddis's sentiments. Perhaps she is just a little nervous that she won't have such access and say with a REAL City Manager? This morning, the City of Hackensack came together at Veteran's Memorial Park to honor our fallen heroes at the Annual Memorial Day Ceremony. Present were members of the community, city workers, Boy Scout Troop 5, the Hackensack Police Color Guard, the Veterans of Foreign Wars, the American Legion, Police Director Mordaga, Fire Chief Freeman, Mayor Labrosse, Deputy Mayor Canestrino, and Councilman Sims. Mayor Labrosse offered remarks and urged the community to remember the tender significance of this day. Presentations were made by the members of Boy Scout Troop 5, the Hackensack Police Color Guard, the City Council, the Chamber of Commerce, the Hackensack Fire Department, the American Legion Post #1, and UNICO. Let us not forget the meaning of this day. Memorial Day, the last Monday in May, is a day of remembrance and serves to honor those who have given the ultimate sacrifice in the service of their country. Let us not forget our fallen heroes. 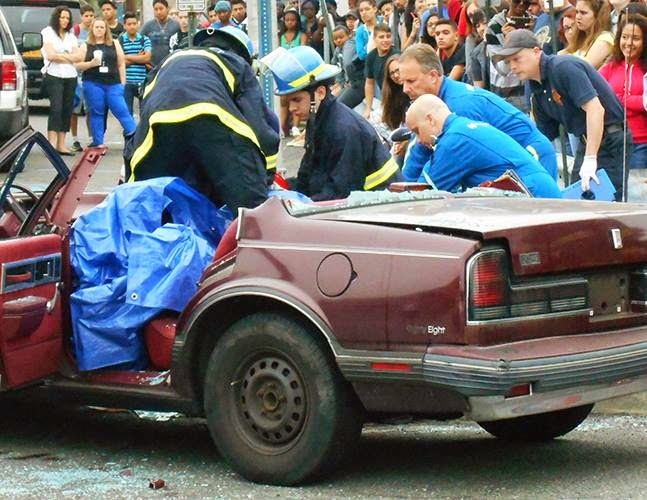 On June 1st the Hackensack Volunteer Ambulance Corps will be hosting a vehicle extrication demonstration (in conjunction with the Hackensack Fire Department) and a community blood drive at headquarters, 225 State Street. At 9:00 am the ambulance corps and fire department will be holding a demonstration of how victims are safely removed from vehicles mangled in a motor vehicle accident. The community blood drive will take place at 10:00 am. All attendees are welcomed to tour headquarters and meet the EMT squad. CALL TO ACTION: COME TO THE C.O.W. MEETING ON MAY 5, 2014! Yesterday was a milestone for the Hackensack Scoop... We had our highest number of unique visitors in a SINGLE DAY, 2,232! Thank you to all the Scoopers for caring about Hackensack, the story tips, and all of the support! The city is in trouble. Out of town thugs have driven a wedge through the Council, split the Council 3 against 2, and are taking over our city. Word is that the Council will be voting on the hire of Anthony Rottino as full time City Manager on Tuesday evening. 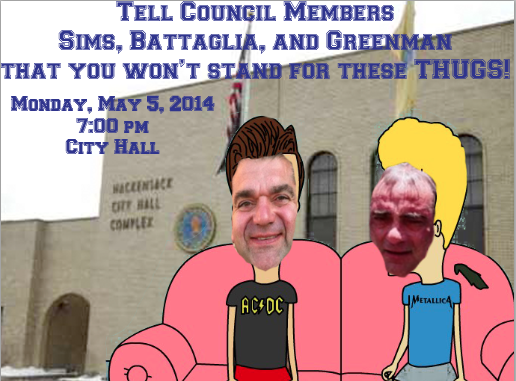 THE RESIDENTS ONLY TIME TO SPEAK OUT, or at least show support of those who will speak out, before they vote is on Monday night May 5, 2014 at 7:00 PM. The residents spoke and asked for a change in the 2013 election. Come out and demand that your city be kept out of the hands of these thugs! With a split council, all it takes is the persuasion of ONE! The Scoop will be there fighting for our City, WILL YOU?